Editor’s note: “Desert Moon”, by Jason Davis, premieres June 28, 2014 at the Flandrau Science Center and Planetarium in Tucson. 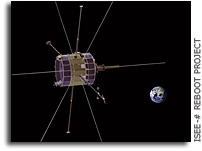 The “Earthrise” imagery retrieved by the LOIRP is featured in the final film. We hope to have a link to an online version at some point soon. In 1961, President John F. Kennedy boldly declared that Americans would walk on the moon before the end of the decade. But at the time, scientists weren’t even sure whether the moon’s surface was solid, or just a thick layer of dust. At the University of Arizona, an astronomer named Gerard Kuiper established one of the world’s first laboratories dedicated solely to lunar and planetary science. His team built telescopes in the mountains above Tucson to create detailed photographic maps of the lunar surface that would help NASA land a man on the moon. Kuiper also became the principal scientist for the Ranger program, an effort to send America’s first spacecraft to the moon. Ranger spacecraft intentionally crash-landed on the lunar surface, sending back high-resolution photos during their approach. Desert Moon follows the origins of the University of Arizona’s Lunar and Planetary Laboratory, and follows the effort to map and understand the moon prior to Neil Armstrong’s famous first step in 1969. The documentary film features interviews with scientists who worked with Kuiper and helped kick-start the field of planetary science. Desert Moon debuts at Tucson’s Flandrau Science Center in Spring 2014. Join us under the stars as we reveal this year’s finalists-and give you the chance to vote for your favorite! Each year we pick a unique theme and ask filmmakers to submit their finest–and shortest–films to our 2-Minute Film Festival. To celebrate the interstellar premiere of Extraterrestrial: The Lunar Orbiter Image Recovery Project, part of the Hillman Photography Initiative’s Invisible Photograph documentary series, this year’s filmmakers explored the concept of outer space. With so much room for interpretation, we received a wide array of stellar entries from across the country and around the globe, and we can’t wait to share them with you! Note: LOIRP Co-lead Keith Cowing will be a guest of the Carnegie Museum of Art as this film featuring the Lunar Orbiter Image Recovery Project is shown in public on 10 July 2014 for the first time.